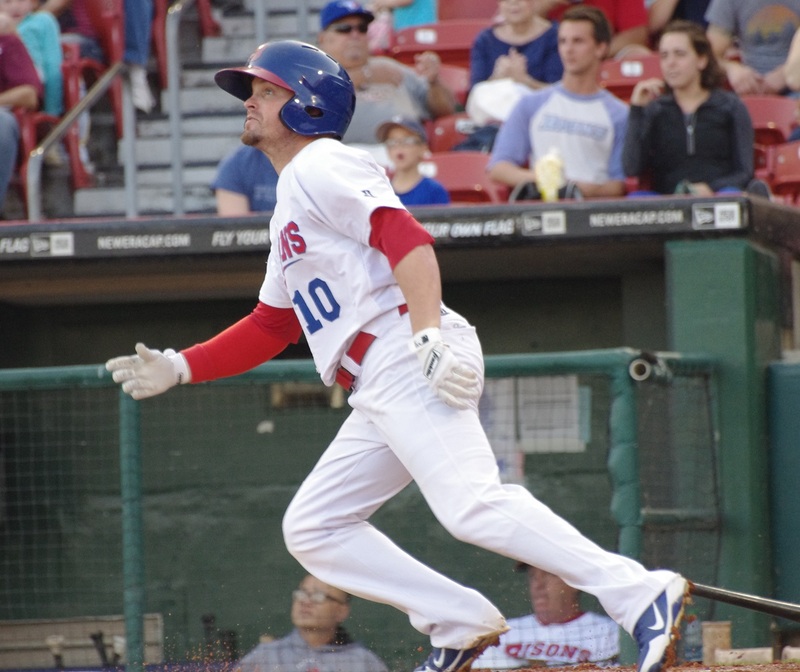 The Buffalo Bisons started out of the gate in gangbusters style hammering opponents in April but gradually cooled off as the year progressed. 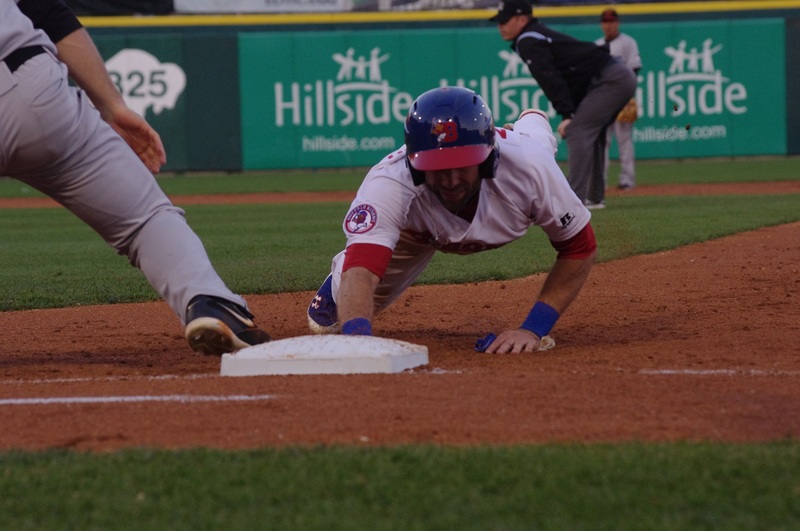 The slugging included a record-setting 27-9 victory over the Syracuse Chiefs on April 18 that featured a cycle from 2B Jim Negrych, a six-hit game from Moises Sierra (who missed a cycle by a home run), two home runs from Ryan Langerhans and a five-hit game from Luis Jimenez. Things did return to normal though. B.C. native Mike Nickeas ended up catching the most games (57) on the season, mostly because he was around for the entire year. Nickeas, 30, was acquired from the New York Mets in the R.A. Dickey trade and actually (because the Blue Jays and Mets exchanged Triple-A affiliates) was a Buffalo Bison for his fourth consecutive season. Nickeas is the truest “good-glove, no-hit” player. While he was solid with the glove, making just one error and allowing only five passed balls, he hit an atrocious .166/.255/.251 on the season in 200 plate appearances. While he probably adds little value to a team with his bat, the Blue Jays organization will be fairly thin in catchers at the upper levels (unless there’s a trade or two) so he might be able to stick around at the beginning of the year next year. Sean Ochinko caught the second-most games for the Bisons this year, getting a mid-season promotion from New Hampshire after Henry Blanco was released and Josh Thole was promoted to the majors. Unlike Nickeas, Ochinko, 26, has been able to hold his own with the bat although his initial numbers in Triple-A weren’t anything to write home about. The 2009 11th-round pick hit a decent .243/.329/.375 in 166 plate appearances with New Hampshire and a worse .220/.294/.313 in 171 plate appearances after his promotion to Buffalo. Ochinko saw a slight drop in his walk rate (only about .5%) after the promotion but his strikeout rate took a huge jump (4%). At the end of the season (August 26), news was released that Ochinko was suspended for taking a banned amphetamine so he’ll be out for the first 45 games or so of the 2014 season. The Jays will need a catcher and may find one through free agency. 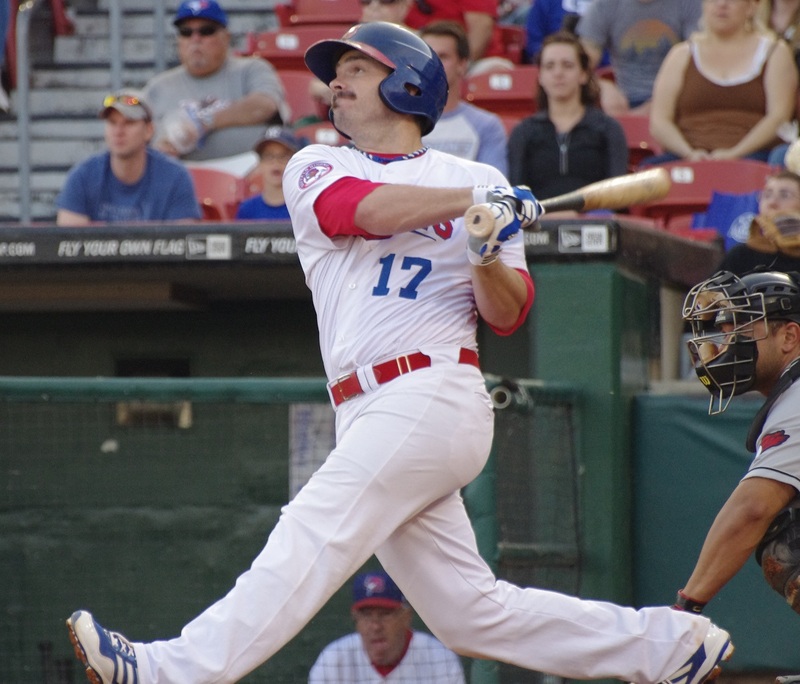 Josh Thole was the third catcher who got a fair bit of playing time with the Bisons. While he didn’t hit nearly as well in the majors (.175/.256/.242), Thole was a very strong force at the plate for Buffalo. In 167 plate appearances in Triple-A, Thole, 26, hit .322/.383/.510 with seven home runs. If the status quo remains (which I think is very unlikely), Thole will remain the backup in the majors for the Blue Jays in 2014. 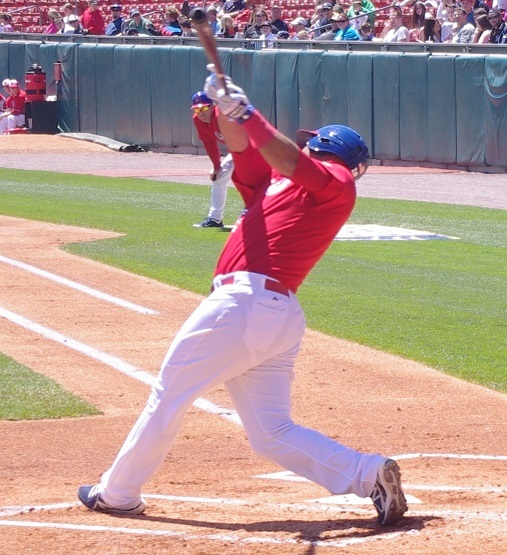 Mauro Gomez played 60 games at first base for the Bisons and was definitely one of the team’s best hitters. Last season’s International League MVP with the Red Sox organization, Gomez, 29, was claimed on waivers by the Blue Jays on April 7 and had an excellent season. In 453 plate appearances, Gomez hit .249/.322/.521 with a team-leading 29 home runs. Gomez is really a DH and, while he played 10 games at third base for the Bisons, really has no business wearing a fielding glove. At this point in his career, he is always going to be what he is with the bat: a home run hitting machine who will strike out a lot and not hit for a high average. After the minor league season ended, the Blue Jays tried to sneak Gomez through waivers but he was claimed by the Washington Nationals. 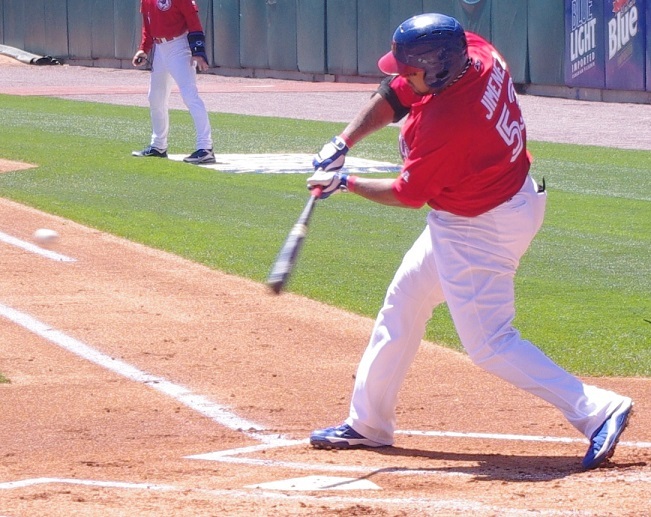 Luis Jimenez is a very large man who can flat-out hit. While he still has very good power, he’s not nearly the “all-or-nothing” kind of hitter that Gomez is. Jimenez, 31, was our Player of the Year after hitting .285/.351/.494 with 18 home runs in 402 plate appearances. Jimenez distinguishes himself from other power hitters with a very good 16.2% strikeout rate (compare that to Gomez’s 28.9% rate) and he uses the entire field a lot more. His future is unclear. He’s a veteran minor leaguer that can go elsewhere if he doesn’t get the deal he wants from the Blue Jays. Buffalo native Jim Negrych was the every day second baseman for the Buffalo Bisons and remained a consistent producer in 2013. The 28 year old was a sixth round pick of the Pittsburgh Pirates in 2006 and was one of the only Buffalo Bisons who hasn’t had a sniff of major league competition. Despite that, Negrych did what he has pretty much always done as a professional ballplayer: hit for a solid average and good on-base percentage with some doubles thrown in. He hit .285/.360/.385 for an above-average (if slightly uncoventional) wRC+ of 111. He only hit three home runs but filled the doubles category with 27 on the season. Negrych has been around professional ball long enough to know who he is and where he stands. Not really a consideration for a big league job, Negrych must know that the Blue Jays have a big organizational need at second base and could probably return to Buffalo if he wants to. Shortstop Ryan Goins is probably best known as the Blue Jays’ second baseman for the last month and a half of the season. For most of the year, however, Goins was the Buffalo Bisons’ every day shorstop and did a solid job at it. I say “solid” because, despite his hot start to his major league career and his second consecutive Webster Award, Goins, 25, wasn’t as good as people might think with the bat. In fact, after reflecting on seeing him play three times with the Buffalo Bisons this season, the only two thoughts that stood out were “smooth with the glove” and “had a good at bat, getting a base hit, against a left-handed pitcher.” Looking over the numbers, Goins hit .257/.311/.369 in 418 plate appearances in Buffalo. According to Fangraphs, this was good for a .311 wOBA and 90 wRC+ — both numbers are below the league average. * After being called up to the majors on August 22, Goins came out hitting at an unsustainable rate that had his batting average above .400 at a point. His final numbers are not nearly so impressive. Goins hit .252/.264/.345 with two home runs in 121 plate appearances. Where does Goins stand going forward? I’m sure the Blue Jays are looking for someone who provides more with the bat to take over second base next season. Goins doesn’t have a lot of power and, although he’ll walk more than he did in his audition this year, his OBP is going to be tied to his ability to hit. His strikeout rates also jumped last year and was almost 8% higher in Triple-A than it was in Double-A. In my opinion, Goins goes back to Buffalo in 2014. Andy LaRoche played third base on most days for the Buffalo Bisons. The 30 year old, who was drafted in 39th round of the 2003 draft has over 1300 major league plate appearances under his belt (adding four to his total in 2013). LaRoche has had a solid bat in the minor leagues but has never been able to translate that into real major league success after some solid numbers in his only full season in the majors, playing for Pittsburgh in 2009. This year, the veteran hit .271/.339/.433 with 12 home runs in 413 plate appearances for the Bisons (he went oh for four in the majors). LaRoche is unlikely to return in 2014; he chose free agency at the end of the season. Veteran utility infielder Mike McCoy, 32, saw some regression in his numbers from last year, playing in the desert air in Las Vegas. This year, he hit .245/.357/.327 with his speed (29 stolen bases) and high walk rate (13.7%) helping him get close to league average run production. His versatility (he played every position except for catcher and first base this season) is another key to his ability to find and keep a job in the highest levels of the minor leagues. While he was a fan favourite with the Blue Jays, McCoy has never hit above .200 in the major leagues and, if he’s back in 2014, it will once again be in a utility role in Buffalo. Playing the most in left field was Eugenio Velez. 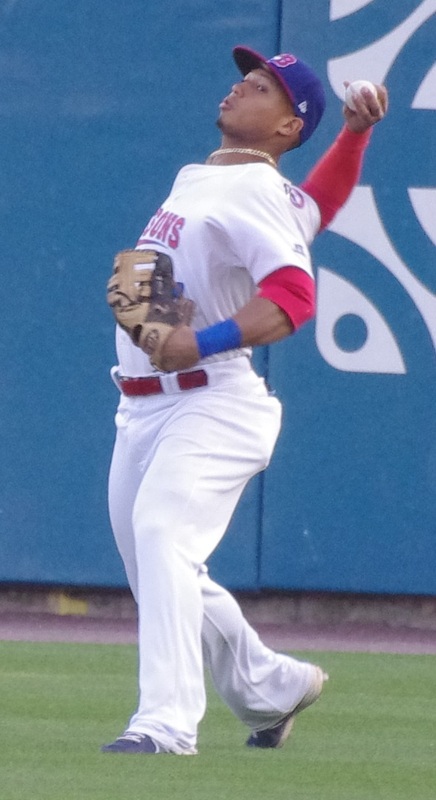 While the 31-year-old Dominican had his fielding issues, Velez was a solid contributor with the bat who was released on July 22 after hitting an excellent .270/.372/.437 with seven home runs and 21 stolen bases in 259 plate appearances with the Bisons. While the release may have been at the player’s request, Velez didn’t stay unemployed long, signing with the Milwaukee Brewers and seeing action with their AAA club in Nashville on July 26. In 175 plate appearances with Nashville, Velez hit .377/.437/.523 with another nine stolen bases. Had the Blue Jays held on to Velez, he could have been summoned at the end of the year when all of the outfielders went down to injury rather than having to go out and resign Ryan Langerhans (a couple of times). Speaking of Ryan Langerhans, the 33 year old former third round pick had a fairly solid season in Triple-A Buffalo despite a low batting average. It was a fairly strange season for Langerhans in 2013. He started with Buffalo, hitting .221/.344/.404 with nine home runs in 248 plate appearances, but he was released on June 21 when the Blue Jays were bringing Kevin Pillar up to Triple-A. Langerhans found work playing in the independent Atlantic League Sugarland Skeeters and, when the Blue Jays were hurting for outfielders, was signed to another minor league deal on August 22. At the conclusion of the minor league season, he returned to the Skeeters for their playoffs. The Atlantic League playoffs concluded, and with more outfield injuries, the Blue Jays selected Langerhans’s contract on September 26 and he went 3 for 11 with the Blue Jays in four games. Langerhans chose free agency after the end of the major league season and will look for work once again in 2014. Anthony Gose is another player about whom there was much virtual ink spilled. He seemed to regress in his time with Buffalo, both with the bat and on the bases. Gose, 23, hit only .239/.316/.336 with the Bisons, which was a far cry from his 2012 Las Vegas numbers of .286/.366/.419. Not only were the ever-important batting average and on-base percentages each down about 50 points but, whereas Gose stole 34 bases and was caught 12 times in 2012, he only stole 22 bases and was caught 13 times in 2013. Gose, after being reunited with hitting coach Chad Mottola in Toronto posted a stronger .259/.283/.408 line in the majors and actually reduced his strikeouts by about 3% at the higher level. While he didn’t take many walks, he did show that there is more in the bat than he showed in Buffalo. I see Gose taking over Rajai Davis‘s role in 2014: he should be the Blue Jays’ fourth outfielder and be ready to take over an every day role in what has proven to be an injury-prone outfield. Moises Sierra has proven that he can be a solid bat at the major league level but his base-running abilities and outfield performance can make him a liability. Sierra, 25, had a strange season in Buffalo, showing depressed walk rates and home runs but still had a solid season with the bat, hitting .261/.309/.422 in 412 plate appearances and featured only 11 home runs and a career-low 3.9% walk rate. In 35 major league games, Sierra hit much better, posting a .290/.369/.458 line with only one home run (but 11 doubles) and a much improved 11.5% walk rate. Sierra’s future is a little more cloudy. Because of his troubles in the outfield (despite an excellent throwing arm) and on the bases, Sierra will have a hard time dislodging any of the current Blue Jays from their job. He could be trade bait this winter as he could probably offer a poor team a solid bat as a right-handed hitting DH or in the outfield if they’re willing to live with his bad routes to the ball and occasional brain-farts. Munenori Kawasaki has had so much written on him, I don’t see the need to contribute too much more. In Kawasaki’s case, the 32-year-old Japanese infielder’s numbers in Buffalo were pretty much what you’d expect: .250/.400/.250 in 81 plate appearances. 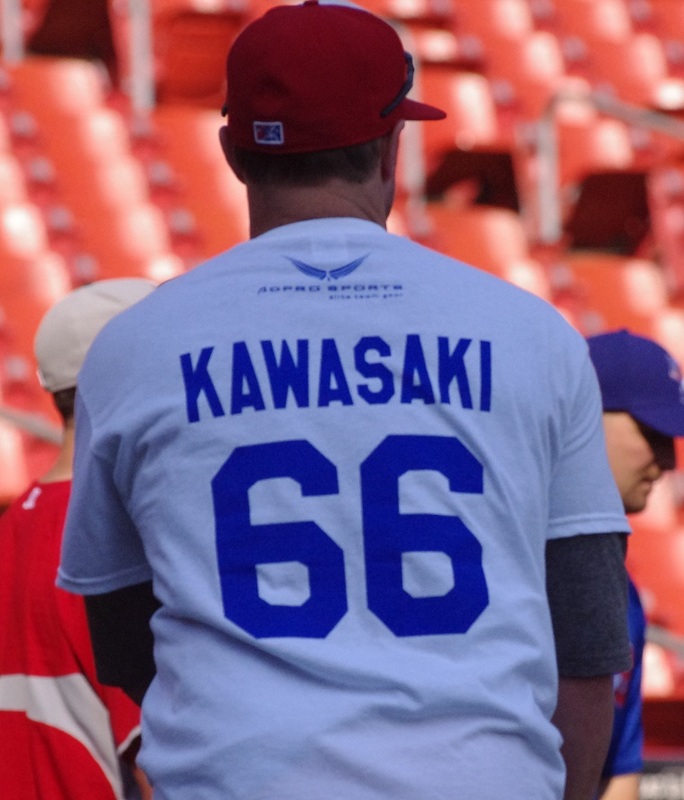 He was as popular in Buffalo as he was in Toronto (as you can see from the photo above in which Mike McCoy wears a Kawasaki t-shirt). 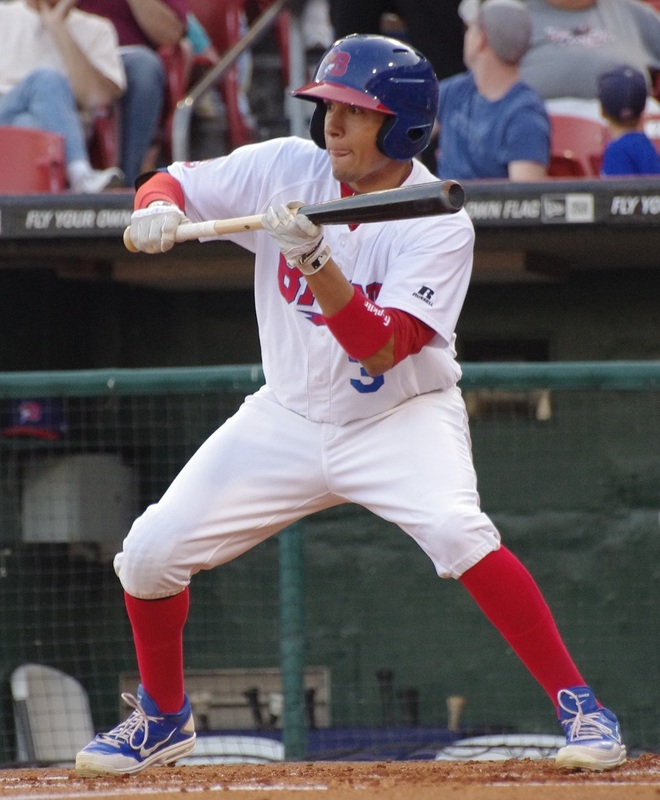 Ramon Hernandez played three games behind the plate before being released and outfielder Blake Gailen was signed away from independent ball to play in eight games with the Bisons (.286/.276/.464 in 30 plate appearances). *According to Fangraphs, a .340 wOBA is about average and any stat with a “+” at the end of it is usually environmentally normalized and 100 becomes the league average and every number reflects a percentage above or below league average. A 90 wRC+ represents run production that is 10% below league average.